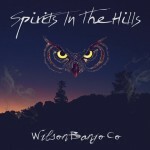 There’s a lot to like about the Wilson Banjo Co., the first band to sign with Pinecastle’s new Bonfire label and record in their new studio in Piedmont, South Carolina. As the CD opens with “40 Years of Trouble,” most apparent about the band is their driving, crisp, banjo-centric sound led Steve Wilson, a masterful player and builder. After releasing an EP with friends in 2015 to promote his custom banjos, he gained national attention and put this current band together with Joey Newton (guitar), Sarah Logan (fiddle), Brandon Couch (mandolin), Dylan Armour (dobro), and Michael Branch (bass).